← Crunchy Whole Grain Chocolate Chip Cookies. Keeping Calm With Tangled Hair. Crispy Mustard-Roasted Chicken. Crispy English Potatoes. 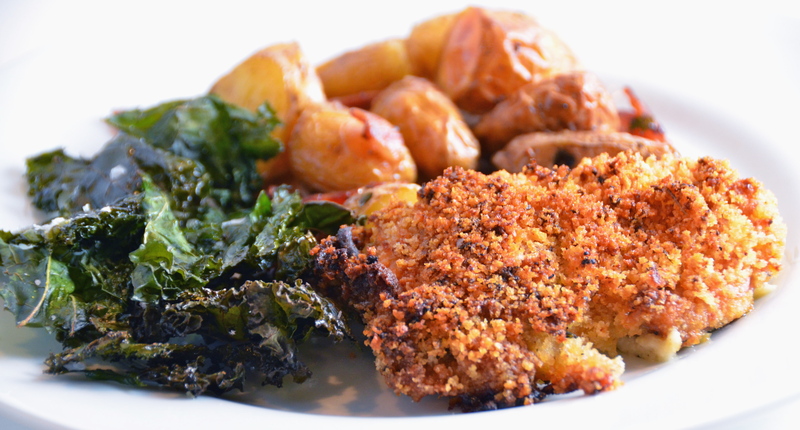 Crispy Roasted Kale. Today’s operative word is Crispy. I received the new Barefoot Contessa cookbook for Christmas. I have all of Ina Garten’s cookbooks because they are filled with simple recipes that always taste amazing. Foolproof, the new book, is more of the same. Jam-packed with recipes I cannot wait to try. I decided, for my first crack at the book, to make this crispy themed dinner. The chicken is baked in a garlicky-lemony bread coating that’s flavored with mustard and wine. It bakes up crispy outside and tender inside. The potatoes are perfectly crisped using this boil first, then roast cooking technique. The bacon adds a nice smokey flavor. 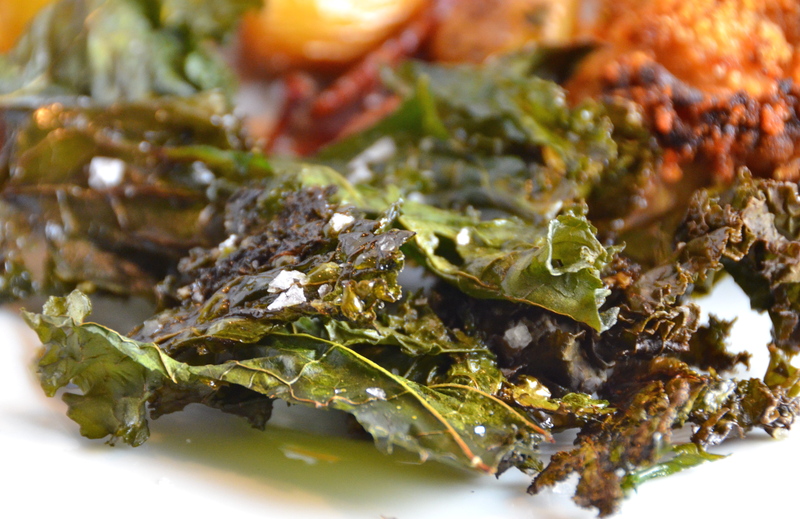 Finally, if you haven’t made kale chips yet, what are you waiting for? They are perfect here as a light side to round out the dinner, but are equally lovely served alone with a glass of wine as a snack. 2. Place the garlic, thyme, 2 teaspoons salt, and 1 teaspoon pepper in a food processor fitted with the steel blade and process until the garlic is finely minced. Add panko, lemon zest, olive oil, and butter and pulse a few times to moisten the bread flakes. Pour the mixture onto a large plate. 3. In a shallow bowl, whisk together the mustard and wine. 4. Pat the chicken dry with paper towels. Sprinkle generously with salt and pepper. Dip each piece in the mustard mixture to coat on all sides, and then place skin-side down only into the crumb mixture, pressing gently to make the crumbs adhere. 5. Place the chicken on a sheet pan crumb-side up. Press the remaining crumbs on the chicken pieces. 6. Bake the chicken for 40 minutes. Raise the heat to 400℉ and bake for another 10 minutes, until the crumbs are browned and the chicken is cooked through. Serve hot, warm, or at room temperature. 2. Cut potatoes into chunks and place in a large saucepan. Cover with water by 1 inch and a tablespoon of salt. Cover pan and bring water to a boil. Uncover, lower the heat, and simmer for 10 minutes. 3. Drain potatoes and return to the saucepan. Shake the saucepan for 5 seconds to roughen the edges of the potatoes. 4. 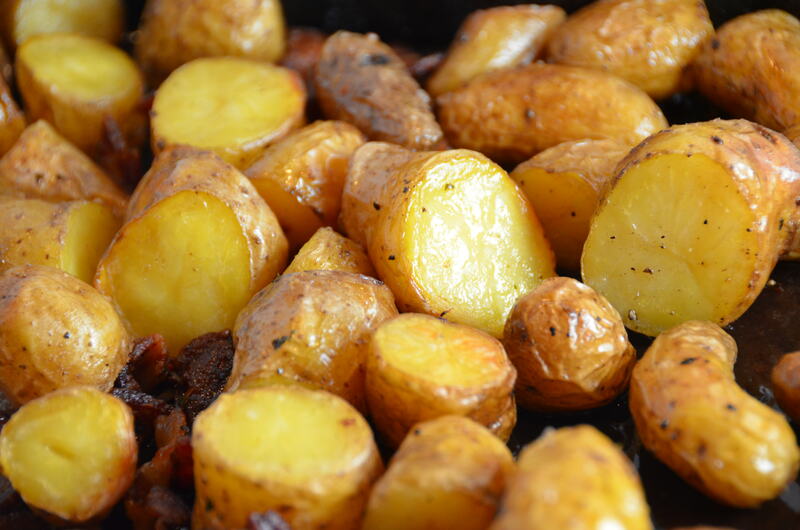 When potatoes are almost finished boiling, place bacon on a sheet pan and roast for 5 minutes. 5. Add drained potatoes, olive oil, 1 tsp salt and 1/2 tsp pepper to the pan with the bacon. Toss with a spatula to mix. 6. Roast for 45 minutes, tossing occasionally, until browned and crisped. 2. Rinse kale. Place the kale leaves into a salad spinner and spin all of the water out of the kale. Place the kale on the baking sheet. 3. Drizzle olive oil over the kale leaves and use your hands to toss and coat the leaves. Season with salt and pepper. 4. 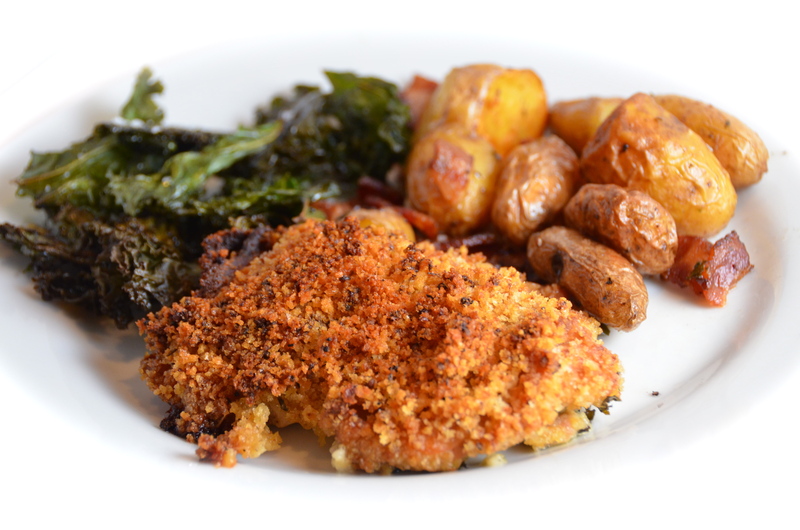 Divide kale between 3 baking sheets and bake in the oven for 15 minutes until leaves are crisp. Remove from oven, sprinkle with fleur de sel and serve. Like the Crisp joke to start, musically we are also in Crisp territory from the ever brilliant Randolph’s Leap. Check out Randolph’s Leap on Bandcamp, where you can also buy the music. This entry was posted in Chicken, Main Courses, Side Dish, Vegetable and tagged Randolph's Leap. Bookmark the permalink. 5 Responses to Crispy Mustard-Roasted Chicken. Crispy English Potatoes. 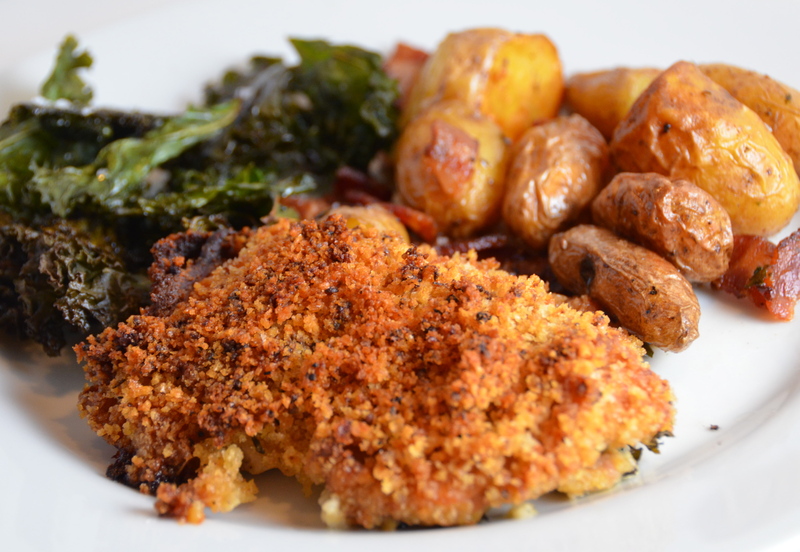 Crispy Roasted Kale. I made the chicken tonight. Used 4 lbs of boneless, skinless chicken breasts cut in half (8 pieces). Skipped the lemon zest and used a generous teaspoon of dried thyme. (Lemons and fresh herbs are expensive). I have made this recipe several times with and without lemon and this chicken fantastic Either way. My husband loves this! Will try the potatoes with it next time! I’ll have to try this again without lemon.